It was just last July when the Gap Fires destroyed the hills of Santa Barbara, including parts of the ranch my parents live on. 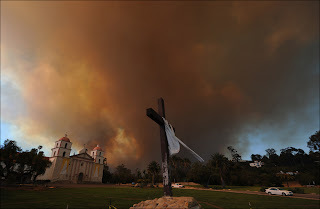 A few days ago another wildfire erupted in Santa Barbara. Right away my friend G$ was evacuated. The fires could be seen from my parents place, but it was miles away and moving away from them. Last night the winds changed and at about 3 in the morning a sheriff deputy came to the house and told them it was time to go. They were already packed and my sister took the dogs to my other sisters house in another county. My parents remained in Santa Barbara. I have been following the fires on the news and on the internet and it is devastating to see peoples homes being burned to the ground. My parents have only been in the home about 5 years but we have so many wonderful memories there. My parents have worked so hard their whole lives and in the last 5 years have been living in a awesome home, in their dream town. Please send good thoughts/prayers to everyone who have been displaced by this disaster. 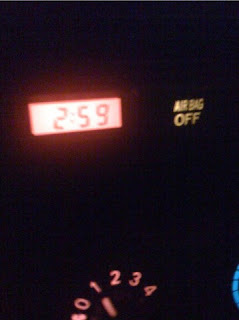 the feeling of Deja Vu... can you believe it, I am all choked up. I sure hope eveything turns out OK.. have your fam in our prayers. mom and pop snuck back onto the ranch this morning and the ranch seemed to escape the flames. they have been there all day, and i'm pretty sure our area turned from a mandatory evac to a evacuation warning. but that doesnt settle my mind considering these winds can get crazy. 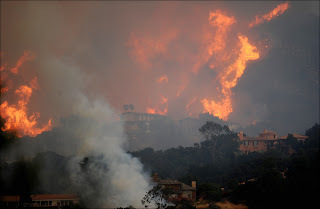 im going to stay in moorpark tonight again and depending on how the fire acts tonight i might go back home tomorrow. I wanted to ask you about this yesterday. They've been showing it on the news here in Arizona. I will say a prayer and light a candle,oddly enough to Santa Barbara in hopes that all turns out well for your familia. 1. All buildings must be retrofitted with rooftop sprinkler systems. Buildings codes have sprinklers inside, why not on the roof! 2. The hills should be sprinklered too. Like large agricultural growers use to water the produce they grow on huge plots of land. Have a permanent built-in sprinkler system in the hills above the city. It can be hooked into the hydrant system. Don't tell me it's too expensive or unrealistic. The technology is simple and far cheaper than a major freakin' disaster every few months that costs lives, homes, tax dollars, insurance claims and logistical nightmares.